We have had a big cold snap. Days on days of wind and very cold weather. 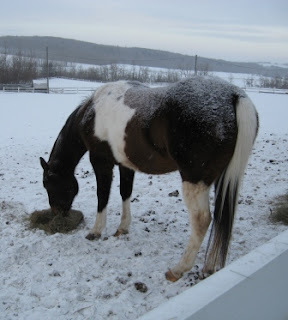 Here is my horse eating with his back to the breeze and snow on his back. He holds his tail so close and tight to his behind. Our horses live outside all the time. They have a large shelter and they grow heavy winter coats. We do not use winter blankets because once you start to cover them you can not stop till spring. I did not buy anything at the Saturday tack sale. Lots to be tempered by.